Did ya'll catch my interview with Molly from Econobusters? She's one cool pony-tailed chick, huh? 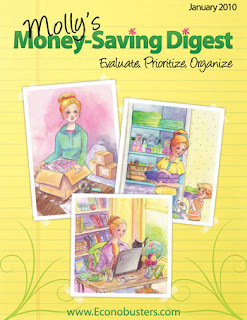 In the January digest of Molly's Money Saving Digest, Molly focuses on ways to Evaluate, Prioritize, and Organize. :) A new year is always a fresh start. It's a great time to get things in order and that's what Molly wants to help us do. You'll find many printable forms that will help you keep your time, money and family in check. And we can all use a little help there, can't we? Like pretty decorations for the home, but hate the price? There are some great and EASY ideas on how to do for less $$. Don't worry if you aren't the crafty type...I said they were EASY! Ever wonder just how to make the perfect pie like Granny always did? Think it's impossible? It's not! I promise. There is an absolutely wonderful article by a guest writer in this month's digest that will have you in the kitchen baking up a storm. Also available this month is Molly Gets Organized ~ All in One Place. This wonderful e-book contains excerpts from ALL of Molly's 2009 digests. It's a month-by-month guide on how to get organized and stay that way! It's jam-packed with printable forms you can use over and over again. Totally awesome stuff right here I tell ya! So head on over to The Old Schoolhouse Magazine's Store and get your copies now.